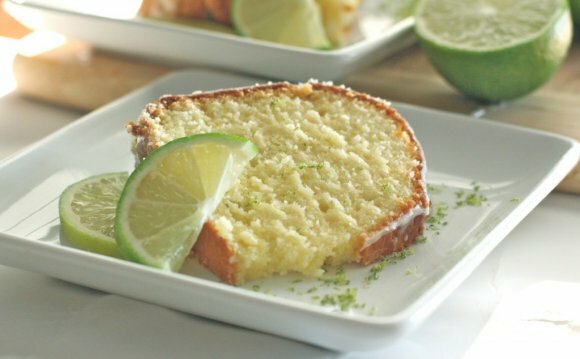 Light, tender and absolutely delicious, this Key Lime Pound Cake is sure to be a family favorite (if you’re willing to share with the family). Have you ever seen a recipe in a magazine that looked so good you bought said magazine for just that one dish? Have you ever then made that one dish and been sorely disappointed, almost the the point of vowing never to buy that magazine again? Well, this isn’t the case with this cake. Sorry for that, but it’s pretty hard to create drama with cooking and recipe reviews so I have to create it in any little way I can. In fact, I didn’t buy this Southern Living magazine. It was given to me by someone who specifically expressed interest in my going through these pound cakes. I did, however, agree to take on this issue after seeing this specific pound cake nestled on page 116. Unfortunately, I couldn’t find any key limes this time so I had to resort to my trusty bottle of Nellie and Joe’s. It’s not squeezed fresh, but it’s darn close and a whole lot easier to get juice from. If you’ve read any of my previous pound cake posts, you know the drill. Lots of butter, sugar, and eggs. Yes, all my yolks continue to be doubles so I only used three, but I added an additional tablespoon of egg white for each egg so my cake would rise like it was supposed to. I peeked in the oven midway through cooking and the cake was rising perfectly so I knew I had done the right thing with the egg whites. At exactly an hour and fifteen minutes I removed the cake to a rack to cool a bit and started making the glaze, which is a combination of confectioners’ sugar, key lime juice and vanilla extract. After the cake cooled for 15 minutes, I removed it from the pan and immediately brushed on the glaze, per instructions. I always am tempted to ignore instructions that call for me to dirty up another utensil. I really thought about using my spoon to just drizzle the glaze on since I had used it to mix it up anyhow. But it just look so much more cool with the brushed coating. I’m glad I followed instructions. This cake absolutely lived up to every expectation I had of it. It did not let down in any area. It’s rich, decadent and delicious. The key lime shines and sings with every bite. It’s glorious. I’m not the only one that thinks so. Hubby has already assured me that it won’t last until Monday and that we’re hiding it from the group of friends that will be coming over tonight. Dudette’s on the same page with us. She’d say more but she’s too busy stuffing cake in her cute little mouth as I type. This cake makes the whole magazine worth while. I could have hated every other recipe and article in it but still considered it a win because of this one amazing dish. Preheat oven to 325°. Beat butter and shortening at medium speed with a heavy-duty electric stand mixer until creamy. Gradually add sugar, beating at medium speed until light and fluffy. Add eggs, 1 at a time, beating just until blended after each addition. Stir together flour, baking powder, and salt. Add to butter mixture alternately with milk, beginning and ending with flour mixture. Beat at low speed just until blended after each addition. Stir in vanilla, lime zest, and lime juice. Pour batter into a greased and floured 10-inch (12-cup) tube pan. Bake at 325° for 1 hour and 15 minutes to 1 hour and 20 minutes or until a long wooden pick inserted in center comes out clean. Cool in pan on a wire rack 10 to 15 minutes; remove from pan to wire rack. Prepare Key Lime Glaze by whisking together powdered sugar, fresh Key lime juice, and vanilla until smooth.